Hainan Airlines is the largest privately owned air transport company and fourth largest airline in China. Whilst Hainan Airlines original base was Haikou Airport on Hainan Island in Southern China, they now operate most international routes to North America and Europe from Beijing Capital International Airport, as well as from some smaller cities such as Xi’an. 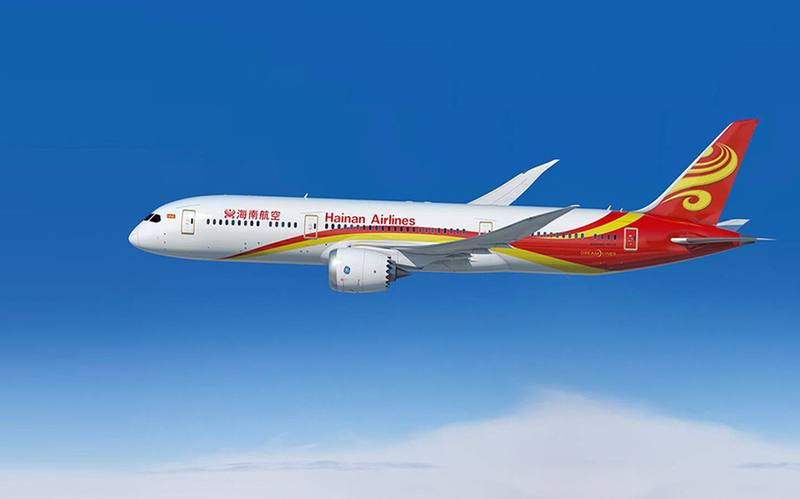 Hainan Airlines has a fleet of over 130 aircraft, and long haul international flights are operated by Boeing 787 and Airbus A330 aircraft. It also operates over 100 Boeing 737-800 mostly deployed on domestic routes. The main airport used by Hainan Airlines is Beijing Capital International Airport. All Hainan Airlines domestic flights operate from their own terminal here (Terminal 1), which offers a convenient and compact terminal and short check-in times. International flights operate from Terminal 2 (connected by walkway to Terminal 1). If you’re heading to downtown Beijing from the airport, you can either take a taxi or use the rail link. By taxi, the journey at quiet times is approx. 30 mins, but beware that Beijing traffic can be extremely busy and this journey time can double at peak periods. The rail link is efficient and comfortable, and takes about 20 minutes. Check in service for Terminal 1 is at an excellent standard in Beijing Airport (served by Hainan Airlines own staff), and there are also many self-serve check-in facilities. International flight check in takes place at Terminal 2. Hainan Airlines domestic First class lounge in Terminal 1 Beijing Airport is spacious, but at peak departure times it can be very busy. A new lounge area in Terminal 1 is being added by Hainan Airlines in 2015/16. Lounge catering in the lounge is good, with a “live” hot food counter serving freshly prepared meals. WiFi is available, although these WiFi speeds mirror many Chinese airport standards and are slow. In Terminal 2, Hainan Airlines use a third-party international Business Class lounge, but this will be replaced in late 2015 by a new, state of the art Hainan Airlines lounge to be opened. On international flights, Hainan Airlines have Business Class and Economy class. Hainan Airlines Boeing 787 and Airbus A330 aircraft offer nice flat bed seats, arranged in a 2x2x2 layout. A very nice duvet and pillows are provided, and cabin staff conduct a high standard of turndown service for customers. Pyjamas are provided, and you receive a Bulgari amenity kit and slippers, with washrooms also equipped with Bulgari products. The onboard catering is generally very good, and is similar to many airline’s First Class standards. A full table service style is applied, and Hainan Airlines is the only Chinese airline where the quality levels for both Chinese and Western menu options are evenly matched, and of a high standard. Cabin staff service is a strong feature for Hainan Airlines, with courteous and friendly staff delivering an efficient and most attentive service, with better language skills than other Chinese airlines. Choice of reading materials is normally very good, with a choice of English language Chinese newspapers, IHT, FT etc being offered, and a wide selection of English language magazines for male and female customers. The IFE programming is satisfactory, with a wide choice of western movies and western TV programmes provided. Don’t expect too much for newest Hollywood releases but total choice is better than other Chinese airlines. Hainan Airlines Economy class seats provide a reasonable standard of comfort, with an average seat pitch and legroom. For the Cabin Seat Layout plans, we suggest you refer to our Airline Seat Plans guide where you can view Hainan Airlines aircraft cabin layouts. A blanket and pillow are provided, both of these are good quality. Economy class onboard catering is well ranked, with a choice of Chinese or Western meal options, the quality levels for both menu options being evenly matched, and of a high standard. The cabin staff are enthusiastic and have a pleasant and courteous demeanour, delivering an efficient and most attentive service. They are well trained with English language comprehension and phrases, although of course some questions may not be fully understood. The IFE programming is satisfactory, with a wide choice of western movies and western TV programmes provided. Don’t expect too much for newest Hollywood releases but total choice is better than other Chinese airlines. The majority of Hainan Airlines domestic flights are operated by narrowbody Boeing 737 aircraft types, although some busier routes may use Boeing 787 and Airbus A330 aircraft. The onboard narrowbody product is divided by First Class seats configured 2×2, and standard Economy 3×3 seating. These narrowbody aircraft are well presented with clean and tidy cabin interiors and décor. A meal or snack is normally served in both First and Economy class, subject to flight duration. It is worth remembering that there are cultural differences amongst many Chinese travellers, and some of these may be disconcerting to western customers. This is an area the Chinese government has been trying to address in recent years, and in 2013 the China National Tourism Administration published a 64-page Guidebook for Civilized Tourism (encouraging better manners). As far as air travel is concerned, you may notice that queuing is often disorderly and when flight boarding is announced, there can be a rapid stampede of travellers pushing and shoving to get through the gate quickly. Loud talking (almost shouting) is another trait you might find disconcerting both on the ground and onboard flights. Spitting remains an issue despite educational promotions to stop this. Despite each airline’s best efforts to keep passengers seated after landing, you may find a number of passengers standing up to retrieve luggage whilst still taxiing. We guess that bit by bit such practices will improve in coming years, but don’t forget there are 1.4 billion potential Chinese travellers. Offering a very high Quality service, Hainan Airlines is a great choice of airline if they serve your route into China. The airline has a true focus and dedication to delivering top quality service, and this is well demonstrated by efficient and consistent standards that Hainan Airlines staff deliver.